Turning to Liverpool Ghost Signs first, we find a book with a familiar layout: colour photos of old and fading (or not so old or fading) advertisements and business signs, accompanied by text captions. 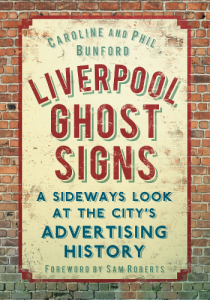 The Bunfords are helping build up an archive of these ‘ghost signs’ which can be found across the UK, and collected and hosted in an archive by the History of Advertising Trust. The signs are a feature of the landscape under threat, because of course they are obsolete in many cases, the buildings on which they were painted may be demolished, and the sheer nature of the signs means they will fade if not actively maintained. The archive seeks to make a record of them, and several in this book are already noted as lost. The subject matter is a naturally fascinating one, and captures some of the intrigue, mystery and discovery which is the main attraction of much archaeology. You’re drawn in by the photos, while in many cases trying to work out if you know the area, or if you’ve seen something similar where you live. However, it’s the captions which reveal the most about these features. Caroline and Phil have truly done their homework, and we find out not only about what the signed company produced or sold, but when they first appear in the directories at that address, and when they left. We also get a potted history – if available – of the company in between. Some companies moved elsewhere, or ended up part of some larger corporation still with us today. One certain featured barber shop (McPherson’s on Peel Road, L20) even celebrated it’s centenary in 2005. The chapters in the book divide Liverpool into three: south, central and north, with other chapters on special topics: co-operatives, cigarette ads, John Irwin and Sons (grocers), and Mosaics. 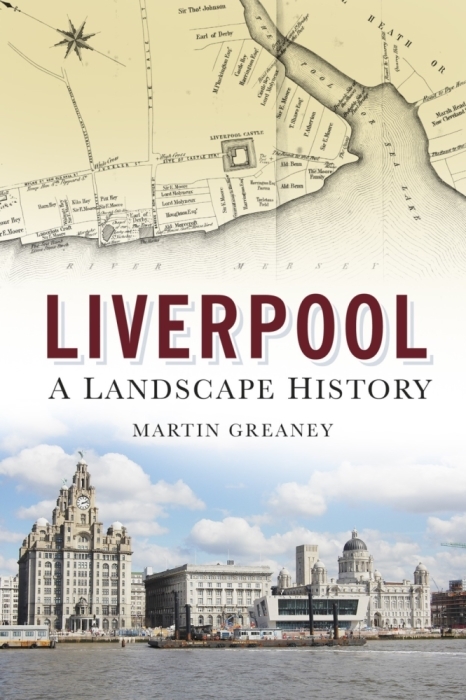 The area chapters bring to life some of the features common to Liverpool life from the 19th to early-mid 20th centuries, but which have largely disappeared today. Suburban dairies were to be found all over the place, as the growth of Liverpool put rural farms too far out of reach for supplying fresh milk to Scousers. They seem to be some of the more frequent sign writers, and it is other businesses which operated on this small scale – bakers, laundrettes, stationers – that dominate the archive. But if you’re expecting just painted signs and corner shop businesses, then Liverpool Ghost Signs will surprise with a number of mosaics (common on shop or hotel steps), gilded letters and metal signs, as well as a range beyond small companies. There are signs to ‘Emergency Water Supplies’ from the Second World War, hotel and pub steps and the occasional warehouse-scale concern. What the book reveals is a sense of a bygone age. The signs are almost all fading, or pointing to something which no longer exists. The businesses are all independent, and mostly locally-established and small scale. I bet a lot of them knew all their customers by name! The signs are at risk because in themselves they are rarely a justification for listing a building, and once that building disappears, then they go too. They are a fascinating – and often gorgeous – glimpse into a world that has disappeared, and they are a record which is itself at risk. 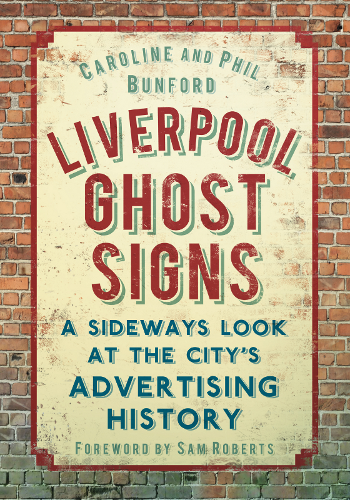 Thank heavens for the Ghost Sign Archive, and books like this which bring a slice of it to us! 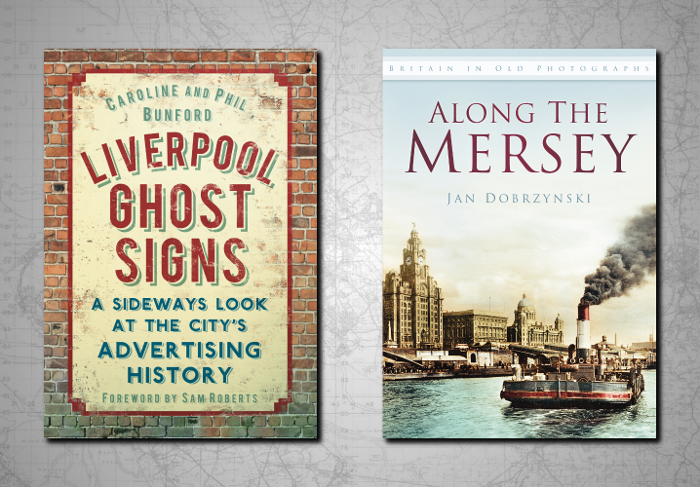 Jan Dobzynski’s Along the Mersey shares many features in common with Liverpool Ghost Signs. It’s one of The History Press’s ‘Britain in Old Photographs’ series, of which I’ve reviewed several on this blog. So it has a similar format – photos and captions – and is a similar sized paperback. 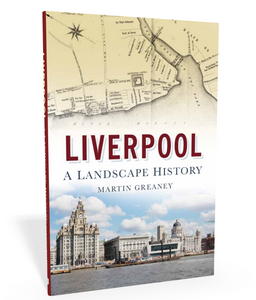 However, the book has a strong narrative structure, rather than a topic, in that the photos are arranged in sequence from east to west along the course of the River Mersey. The first images we see were taken around the Rivers Goyt and Tame near Stockport, with the series moving through Runcorn, Widnes, Birkenhead, Liverpool itself and New Brighton, ending with an image of the Perch Rock Lighthouse guarding the entrance to the Mersey. Another key difference here is the length of the captions. There’s much more ‘history’ in this book, and it took me a lot longer to read than I was expecting. The captions are full of interesting insights, but also the book’s weak point, which I’ll come to. The images of Liverpool, for anyone who’s seen their fair share, will likely be familiar: they cover the Pier Head landing stage, the ferries, the Three Graces, the Albert Dock and the Overhead Railway. There are also some great examples which I’d not seen before, such as the view from a liner as it left the absolutely heaving Pier Head. There are also several good images which take in scenes from directions you might not have seen before. But in general, if you’re looking for Liverpool photos then you’ll find little unique here. Where Along the Mersey proves itself for Liverpool historians is in the sections where the city’s history is tied with that of the Wirral. Cammell Laird Shipyard, the Woodside ferry terminal and the promenade are all seen here in a way that emphasises just how closely related the two sides of the river are. We’re told about the Liverpool Harbour Master John Agnew, who lived in Egremont and commuted to Liverpool in his own private ferry. We hear about the middle, upper and working classes who all travelled to New Brighton on their holidays (albeit in slightly different eras). These might be familiar stories in a sense, but they’re often given their own slim volumes, rather than tied together so well as they are here. Where the book is strongest is in its early pages, dealing with the upper stretches of the Mersey, the Manchester Ship Canal, the Goyt and the Weaver. These rivers are intertwined much more when upstream, and the photos in this early part of the book are an insight into the Mersey’s humble beginnings. 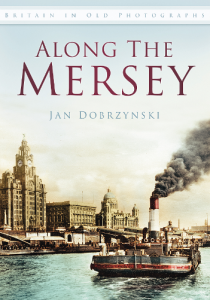 It’s this unique perspective of the book – taking in everything in the Mersey’s path, which brings home the interconnectedness of the places more than any other book I’ve read. Passing under the M60 for the first time, it [the Mersey] then passes under the Manchester Road B5095 Bridge at Cheadle. This is accompanied by a photo of a little hump-back bridge with little more than a stream beneath. The pairing is comic, but the real question is: is this bridge now the B5095? It’s something that would be worth clarifying. There are a few captions like this, and it would be good to know if the feature in the picture is being described, or whether a more modern version has replaced it. Over recent years the Environment Agency has invested in flood defences at Stockport, Cheadle, Gatley, Northenden, Didsbury, Chorlton, Stretford, Ashton-on-Mersey, Carrington, Flixton and Irlam. Whether we needed this ‘Rail Stations of Cheshire’-esque detail is a matter for debate, particularly as the photo above it is of a beautiful unspoiled river channel (still in existence, I understand). As always, I’ll finish by asking which book you should get – or if you should splash out on both! Liverpool Ghost Signs is the better book in terms of the balance between photo and caption. Each compliments the other well, adding just enough detail to bring out the history. In Along the Mersey, on the other hand, the captions and images often don’t quite match. Sometimes there’s too much info, and in other cases there simply seems to be too little to connect the two. Along the Mersey has both the most familiar and the most obscure images (in a good way! ), and so has perhaps a number you’ll not have seen before. This will be particularly the case for the less written about areas upstream. If you want to increase your photo collection of the Mersey valley, arranged in a novel way, as well as details of the vast development which has been imposed on the area in the 20th century, Dobrzynski is for you. But for a unique topic with just enough extra background info, then the Bunfords deliver throughout. As always, thanks go to the publisher, The History Press, for supplying me with copies of these books for the purposes of this review (and of images for illustration).